Landscape at Turkhunsey. Palamow. Nov. 1813.
bl.uk > Online Gallery Home	> Online exhibitions	> Asia, Pacific and Africa Collections	> Landscape at Turkhunsey. Palamow. Nov. 1813. 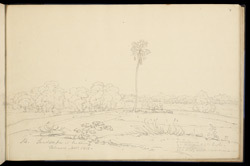 Pencil drawing of a landscape at Palamau, Bihar by Robert Smith (1787-1873) dated November 1813. This is one of 27 drawings (28 folios) of views in Lucknow (Uttar Pradesh) and Sasaram, Hazaribagh and Palamau (Bihar) taken in 1813. Inscribed on the original cover is: 'No. 1. Luknow. Hazaribagh. Palamow' 'etc.' Captain Robert Smith was a military engineer with the East India Company and was in India from 1805 to 1833. He designed a number of buildings in India and also repaired various Indian monuments including the Kutb Minar and the Jami Masjid at Delhi. In 1813 to 1814 he was surveying on the Mirzapur South frontier. ‘It is an ill-exposed country, and little comparatively is known of it, but that it is rough and irregular. Torrents are numerous in the rainy season, and most of them discharge themselves into the River Koel, which, taking a direction north-west passes into the British district of Behar, and falls into the Son on the right side … having a total length of course of about 130 miles. The torrents quickly disappear as the dry season advances. To this, however, the Koel is an exception, retaining a continuous stream at all times. The mountains are every-where covered with forest or jungle, containing a great variety of trees and shrubs…. There are, however, numerous villages and hamlets dispersed over [the district]; yet altogether it is very thinly peopled’.